I awoke to find chaos had occurred in a small town called Ferguson, Missouri where a policeman shot and killed an unarmed black teenager. He was 18. Still in his teens. Not able to buy alcohol, but still legal. As tears streamed down my face and I ached for the young man I never met, I said a prayer for peace. Peace in that town. Peace in the family. Peace in the police department. Peace for humanity. I can’t imagine what that family is going through at this moment. I am saddened to think “what if”. What if it had been my son? What if it had been someone I know? My church school students? My friend’s son? What words of comfort could I offer to help them through this difficult time? What words of comfort could I offer to other parents who raise black boys? I stumbled over the words to write that could offer a semblance of hope in a difficult time. Another young man was murdered and we are left to wonder why? Was he armed? No. It was this picture that broke my heart. I believe in an officer’s right to protect and serve. I believe that in order to do their jobs sometimes they have to make difficult judgement calls in life threatening situations. I believe in safety. But, I also believe that there are bad people out there that want to wage a war against our youth. I believe that bad people work in all fields hidden in society where we are left wondering their true intentions. They wear a mask of anonymity and we always question it when situations like this occur. What is their real motive? We will never know. 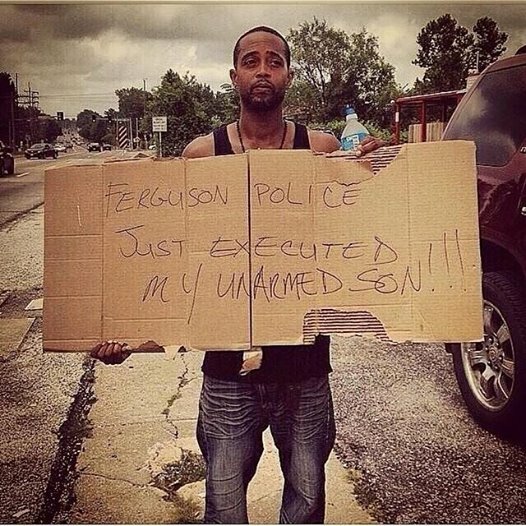 Because it seems as though it is open season on our young black men. I am scared. I am scared for my son. I am scared for my beautiful black boys in my church school class. I am scared for the many nameless young men out here who will never grow up and be able to legally buy alcohol, graduate from college, vote or get married. Your life has ended and there is no excuse, but I will pray for peace for you, your family and your community. Violence begets violence and no one should ever think “Kill the Police” is a good idea.